GRAFTON — The history of America’s oldest state police force finally has a proper headquarters. 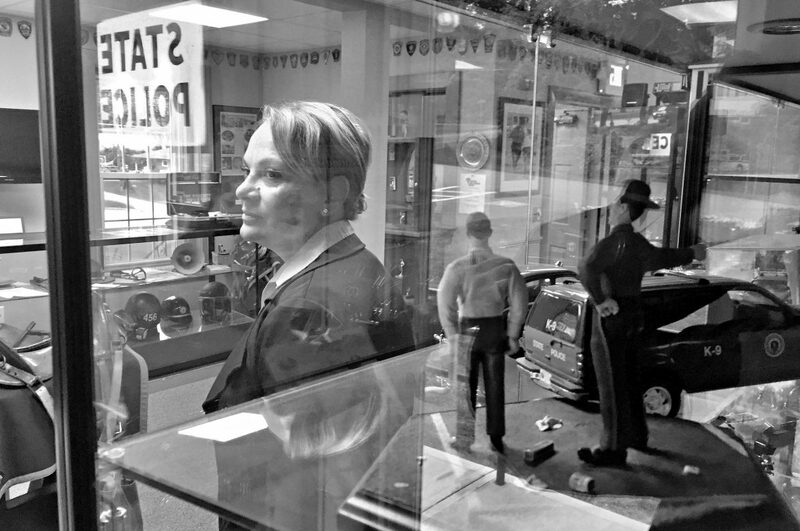 In an unassuming brick barracks in Grafton, Charlie Alejandro is slowly transforming the State Police Museum’s first wave of priceless criminal-thwarting knickknacks from a haphazard labor of love into a solidly-run nonprofit. Do not form the wrong mental picture as you read “Charlie!” Far from the jut-jawed, crew-cut he-man trooper of stereotype, Alejandro’s a small but powerfully built woman who won Mrs. Petite America Massachusetts 2011. Charlie Alejandro, museum director at the Massachusetts State Police Museum and Learning Center in Grafton. Having proved herself up to assignments like the Major Crimes Unit and serving undercover in Revere — and terrifyingly, as a road tester, facing the very real peril of finding out whether random 16-year-olds can drive without killing themselves and her — Alejandro definitely comes across as someone who can whip the outpouring of officers’ attics and photo boxes and document files into a coherent collection. Other, younger state forces have long had their own museums, repositories for electronics and guns and badges and uniforms and above all, stories of bravery and tragedy and service. But Massachusetts’ version was a only a corner of State Police HQ in Framingham for years, as a cadre of veterans tried to figure out how to get the funding and space for a proper home. Throughout the 1990s and 2000s, the museum’s founding director Ed Montague lobbied for the cause, and eventually he and other history-minded police vets got a check-off approved on troopers’ paychecks allowing them to fund museum operations and its only paid staffer, Alejandro, a part-timer. The Grafton barracks was decommissioned in 2006 when the state built a barracks in Millbury near the new Mass Pike exit. That made it a fitting candidate for the museum; the ribbon-cutting was sped up so an ailing Montague could attend. He passed away in 2015, well before collections were fully moved in and displayed. The artifacts still have a somewhat jumbled feel, a delight to anyone who likes historical surprises. For 40 years, the smallish brick Grafton barracks, like the others, was a combined office, jail and dormitory. On one side downstairs was a dispatch desk staffed by a duty officer, with a two-cell steel lockup off a work area for doing paperwork. The lockup looks as solid and grim today as it did in the Depression. On the other end downstairs was a kitchen and mess hall. Nowadays, a fascinating hodgepodge of police paraphernalia sprawls in display cases arrayed around the rooms. The window sills do duty as display shelves — here a radar gun from the ’60s, there a wooden shield of the Registry Police. The Registry force, now defunct, was one of the four agencies merged into the State Police during a controversial Weld-ian consolidation in 1992. Alejandro would like them each to have their own space in the museum someday. In the back rear corner, where troopers used to bring in suspects they’d arrested through the kitchen, is a mock-up of maybe the most famous image of any Mass. state trooper: the Norman Rockwell painting of a trooper and a runaway eight-year old encountering each other at a lunch counter in Pittsfield. Alejandro has brought “The Runaway” to life with a mannequin, a real counter and lunch stools. In the alcove leading to the diner mock-up are a negotiator’s vest and a Bomb Squad suit, across from a canvas and metal stretcher from a time when every trooper had a stretcher in his cruiser — most of Massachusetts was so rural, and emergency medical help so remote, the trooper at the scene of an accident was usually the victim’s best option for hospital transport. Upstairs — where troopers used to live for six days at a time, before a march on the State House by State Police wives brought an end to the barracks-life system — Alejandro and her corps of volunteers are working on a re-creation of one of the barracks bedrooms, where two men lived like college roommates. The building itself is a fitting venue. Built in 1931, it looks like almost all the other State Police barracks, which were all built around that time, as the force was professionalized year by year. The State Police as now understood — a force dedicated to highway safety and pursuing crime across town borders — originated from the need for the cops to keep up with the robbers. In 1921, the automobile had become prevalent, and criminals were increasingly outrunning a law enforcement based on foot and horse. The motorcycle was the original vehicle of choice for the State Police, and it exacted a terrible price. The roll of honor of State Police officers who’ve given their lives on duty starts with a long litany of troopers, young mostly, who died crashing their motorcycles on patrol. Long before the ’20s, though, the state saw the need for a police force more comprehensive than town squads — mainly to combat alcohol as the temperance movement grew, but also to serve the many parts of the state that had no police at all. So in 1865, Gov. John A. Andrew commissioned the first state officers. Mostly veterans, mostly Irish, they typified a profession held in not much higher esteem than the ruffians they pursued. Alejandro says some of those first troopers arrived with the arms, including cutlasses, they acquired during service in the Civil War. “I’m trying to get one of those on loan so we can display it,” she says. Her inclination, at least for now, is to emphasize the “glamour years” of policing and uniformed service in general — when anti-cop controversies were decades away and Americans viewed the State Police as their protectors on the roads. During the ’30s through the ’50s, the State Police had a shooting team that was the pride of the state, and Alejandro is preparing a display of five of that team’s weapons and a “shooting box” in which officers carried their guns to meets versus other state’s departments. “They’d pack up, go to a meet, and like I say, they were working six days out of seven, so they’d come back here and get right back to work,” the director says. Alejandro is not a historian and doesn’t plan to become one. Her emphasis in this new phase of her professional life is not so much on collections and interpretation as on bringing the museum up to speed as a well-known, credentialed institution of history: ADA compliant, with “living archives” of investigations and those who served in readily-accessible databases, and exhibit rooms and fundraising practices that rival those at the best state-police museums. Her five-year plan includes building a garage in back for the museum’s historic cruisers, which range from 1931 to 1978 and always draw a crowd when they’re displayed. And beyond attracting people to Grafton, Alejandro wants “to bring the museum to them,” with a mobile unit that can set up at schools and community centers. “Ed (Montague and his fellow founders) did the really hard work, had the really hard job,” Alejandro says, but leaves unspoken the hours she’s put in learning on the job the best practices of running small nonprofits. She does not keep the pride out of her voice, though, when she reports having won accreditation from the National Museum Association. There are fully trained historians in the cadre of cronies that work on the museum as volunteers, chronicling their service and its context in the state’s histories. They do everything from mow the lawn to build the display cases to digitize the holdings — thousands of documents and photos donated by the many men and women who’ve served the State Police over the years, scanned on a cutting-edge device the FBI would envy. Just as generations of past troopers worked together in the upstairs sleeping quarters, so now the grey-haired volunteers labor side-by-side, striving to preserve that past for the appreciation of future scholars and citizens. The Massachusetts State Police Museum and Learning Center is open Tuesdays and Thursdays, 11 a.m. – 2 p.m., and by appointment. Call 978-606-7933. 44 Worcester St., Grafton.